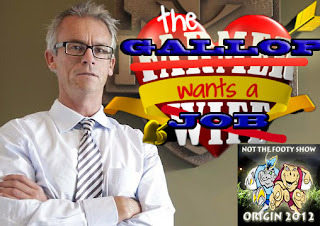 The Gallop wants a job? NOT The Footy Show asks the question: What could David Gallop do next? Get NOT The Footy Show Episode 110 and 'enjoy' Warrick Nicolson, Matthew Duncan, DC Chapman and YES Nic McInerney (we found him!) talking Gallop's legacy and future, Preview Origin 2 and tip Round 14 of the NRL. Also in Episode 110 we hear an exclusive, breaking, developing, we're hearing, official announcement over the future of an NRL coach... Eyes has the mail you don't want to miss. We also ask why doesn't the NRL play a regular fixture during the day on the Queen's Birthday Long Weekend Monday and why aren't clubs lining up to play on the day? NOT The Footy Show is getting so popular we hear the Queen wants us at her next diamond jubilee celebrations. NOT The Footy Show will release another Podcast next Thursday night - June 14 with our State of Origin Game 2 Recap and Round 15 Preview Show.